Shrubs (also called bushes) play an important role in home landscaping. Shrubs are woody perennial plants with multiple stems that provide visual interest and structure, as well as privacy and traffic control planted in the ground and in containers. Used solo, a shrub can be a dramatic a focal point. In groupings, they become hedges forming borders, windbreaks and screens. 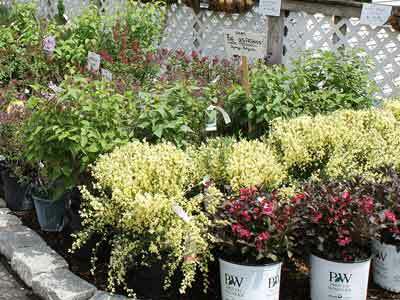 We have a extensive selection of shrubs in all sizes and colors. Our Nursery Experts are here to help you with choosing the best shrubs for your landscaping plans. Just ask us!